The top wire on the original 1903 Guanajuato line was vulnerable to lightening strikes. 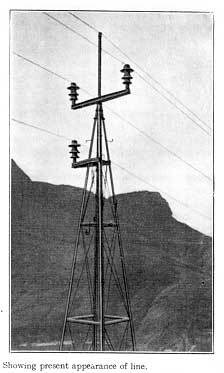 In 1906, the towers were fitted with a lower crossarm to carry the third insulator. The pipe which previously supported the top insulator was used for a fourth wire, grounded at each tower. The additional wire provided excellent protection against lightening and became standard practice for the industry. When the grounded wire was added, the line was also fitted with larger insulators. In particularly lightening-prone regions, the huge M-3990 was used. In less exposed areas, a smaller insulator of similar design was used, as shown in the photo to the left (compare with photo of 1903 line). 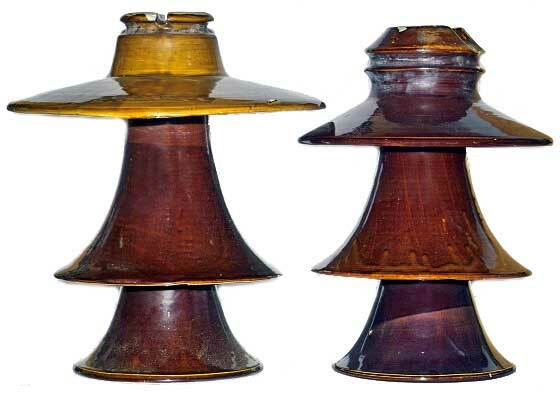 No specimens of either of these insulators have ever been recovered until 2004 and are shown here for the first time. The M-3990 on the left is 18in. diameter and 20in. tall, making it larger than the M-4800. The new discovery on the right was assigned M-3940 by Elton Gish in July, 2005. They were both recovered from the line in late 2004 by our collaborator Alonso Rodriguez.